Presenters include: Richard Gibbs, from iCity; Will Teasdale, Hackney Council and others. We've decided on a slight change of plan for this Thursday's event. We've decided to keep it an informal get together in the Crate Brewery, for like minded indvividuals, start ups, and techies to get together to talk about recent changes in the area. There will be some free beer for those who arrive early. Starting at 7 PM tomorrow. There is no need to print tickets!!! Just show up. Of course, we were always only going for that free beer. In the end it turned out there was a table full of free (Crate) beer - Golden, Best and IPA - but no-shows from LBH's Will Teasdale and iCity's Richard Gibbs. According to organiser Christian Ahlert, Gibbs had emailed apologies in the morning on the day. 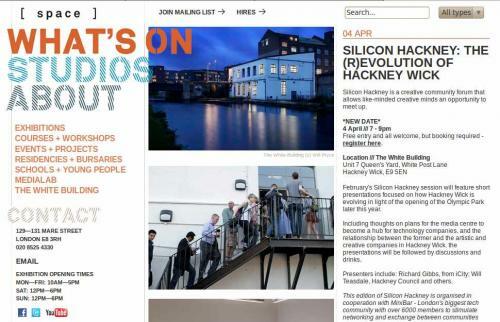 Regrettably, much lower turnout compared to past Silicon Hackney events too, whatever that might mean. Submitted by Steve Dowding on Wed, 03/04/2013 - 21:37.